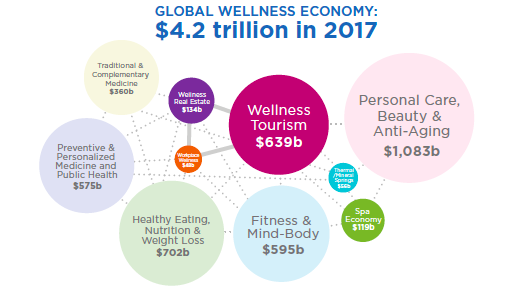 This week, The Global Wellness Institute announced that the wellness industry is now worth a staggering $4.2 trillion (yes, trillion!). The 2017 figure is encompassing of 10 different sectors, including spa, beauty and anti-ageing, fitness and mind-body as well as wellness tourism. These figures don’t lie — wellness is BIG business and accounts for 5.3% of global economic output. Read below for our hi-lights and click here to download the full report. What does this data mean for the spa sector? According to Fast Company’s take on the newly released data, consumers are evidently drawn to places where they can make self-care a regular and meaningful part of their lives. The number of spas has doubled since 2007, producing 2.6 million employment opportunities. This industry is driven by rising incomes, rapid growth of wellness tourism and an increasing appetite for wellness. Wellness tourism is undoubtedly the leader of the pack in terms of growth — valued at $639 billion. Wellness tourism is defined as ‘travel associated with the pursuit of maintaining or enhancing one’s personal wellbeing’. The 6.5% growth rate of this sector is more than double the 3.2% growth rate of tourism in general. Recent industry movement absolutely supports this data - fitness giant Equinox recently launched fitness and wellness getaways, and the team behind mega-blog Well + Good began hosting retreats last year. We know that wellness is a major consumer priority and an economic driver not to be ignored — but what will the future hold? The evidence shows that this industry is not going away, nor is it slowing down. The GWI projects the strongest growth across the following three sectors in the next five years: wellness real estate, workplace wellness and wellness tourism. It should be noted however, that much of the wellness economy caters specifically to the wealthiest of consumers. The options for the wealthy are endless — wellness retreats, $30 boutique fitness classes, superfoods and more. Those leading the industry must be mindful of possible backlash and be mindful of the potential of a shrinking customer base should this issue continue to polarize.